The rear seats are each fi tted with a three-point inertia reel seat belt with force limiter. Do not invert the seat belt buckles as they will not fulfi l their role fully. 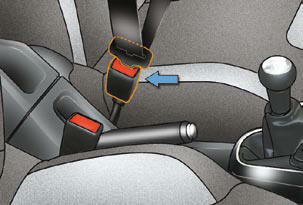 The seat belts are fi tted with an inertia reel permitting automatic adjustment of the length of the strap to your size. The seat belt is stored automatically when not in use. The inertia reels are fi tted with an automatic locking device which comes into operation in the event of a collision, emergency braking or if the vehicle rolls over. You can release the device by pulling rapidly on the strap and releasing it. - must be pulled in front of you with a smooth movement, checking that it does not twist, - must not be altered or modifi ed to avoid altering its performance. In accordance with current safety regulations, all repairs and checks must be carried out by a CITROËN dealer who guarantees that the work is carried out correctly. Have your seat belts checked regularly by a CITROËN dealer and particularly if the straps show signs of damage. Clean the seat belt straps with soapy water or a textile cleaning product, sold by CITROËN dealers. Use a suitable child seat if the passenger is less than 12 years old or shorter than one and a half metres. Never use the same seat belt to secure more than one person. Depending on the nature and seriousness of the impacts , the pretensioning device may be triggered before and independently of the airbags. Triggering of the pre-tensioners is accompanied by a slight discharge of harmless smoke and a noise, due to the activation of the pyrotechnic cartridge incorporated in the system. 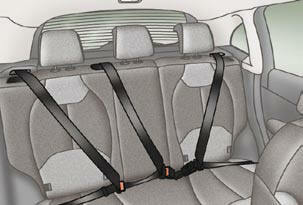 Following an impact, have the seat belts system checked, and if necessary replaced, by a CITROËN dealer.